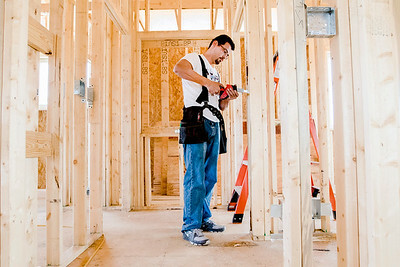 Sarah Nader- snader@shawmedia.com Edwardo Valdivia works on a home at Cambria in Lakewood Friday, April 17, 2015. Cambria is a planned 70-home subdivision designed for empty nesters. Caravelli is crowd funding for the capital to build the starter stock of completely finished and drywall-finished homes. Investments start at $20,000. Sarah Nader- snader@shawmedia.com Mark Mika works on a home at Cambria in Lakewood Friday, April 17, 2015. Cambria is a planned 70-home subdivision designed for empty nesters. 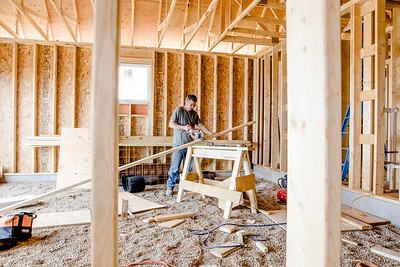 Caravelli is crowd funding for the capital to build the starter stock of completely finished and drywall-finished homes. Investments start at $20,000. Sarah Nader- snader@shawmedia.com Francisco Bucio mixes cement while working on a home at Cambria in Lakewood Friday, April 17, 2015. Cambria is a planned 70-home subdivision designed for empty nesters. Caravelli is crowd funding for the capital to build the starter stock of completely finished and drywall-finished homes. Investments start at $20,000. 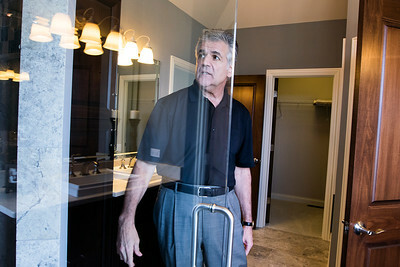 Sarah Nader- snader@shawmedia.com George Caravelli, president of Worthington Enterprises, points out some high end finishes in the bathroom at the Innisbrook model home at Cambria in Lakewood Friday, April 17, 2015. Cambria is a planned 70-home subdivision designed for empty nesters. Caravelli is crowd funding for the capital to build the starter stock of completely finished and drywall-finished homes. Investments start at $20,000. Sarah Nader- snader@shawmedia.com George Caravelli, president of Worthington Enterprises, points out some high end finishes in the Innisbrook model home at Cambria in Lakewood Friday, April 17, 2015. Cambria is a planned 70-home subdivision designed for empty nesters. Caravelli is crowd funding for the capital to build the starter stock of completely finished and drywall-finished homes. Investments start at $20,000. 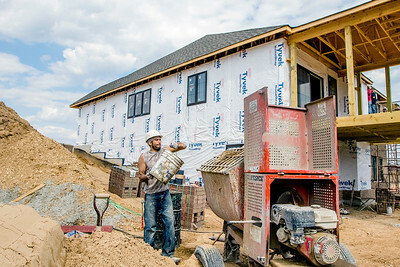 Mark Mika works on a home at Cambria in Lakewood Friday, April 17, 2015. Cambria is a planned 70-home subdivision designed for empty nesters. Caravelli is crowd funding for the capital to build the starter stock of completely finished and drywall-finished homes. Investments start at $20,000.